I found this china bowl on Saturday at the weekly Stuttgart flohmarkt (flea market). It has a transferware pattern and two stripes of orange lusterware glaze. The mark on the bottom says “made in USSR.” It cost me €7, and I am very pleased with myself about it. I added two little pots of forced miniature daffodils from the grocery store. To see what other bloggers have put in a vase today, please visit Cathy at Rambling in the Garden. 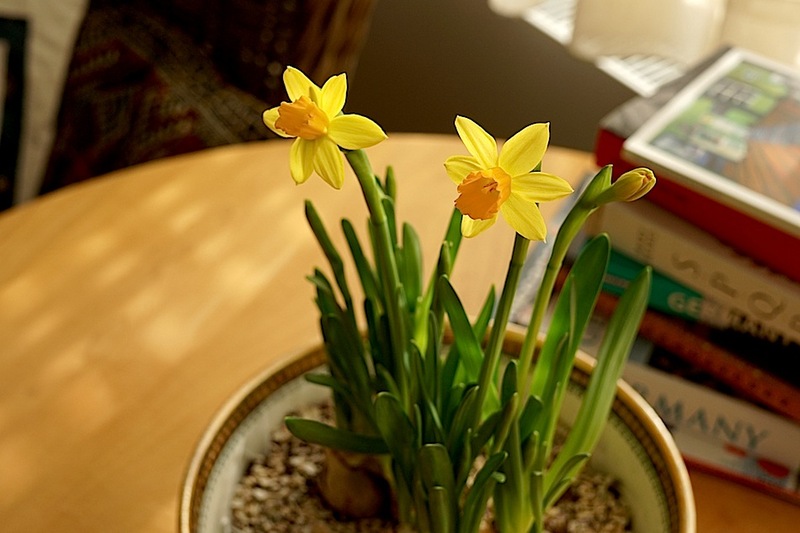 Your Soviet bowl is a great find – and brings an exotic touch to your narcissi! Hi Cindy, that’s a great-looking bowl. The daffodils are perfect for it. Your bowl was a lucky find! It’s beautiful and works very well with the daffodils to create a bowl of sunshine, the perfect tonic for the cold of winter. 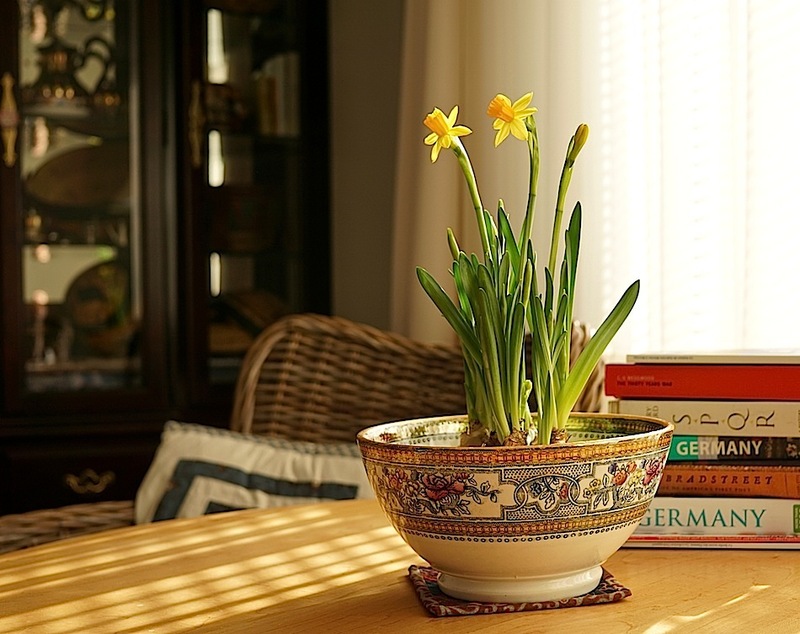 That bowl is perfect to host those lovely daffs….and with that wonderful sunshine behind the curtains streaming in, it all just glows and sings spring! Made for each other! What a lovely combination! Lovely bowl and dear litttle narcissus. A little bit of spring. 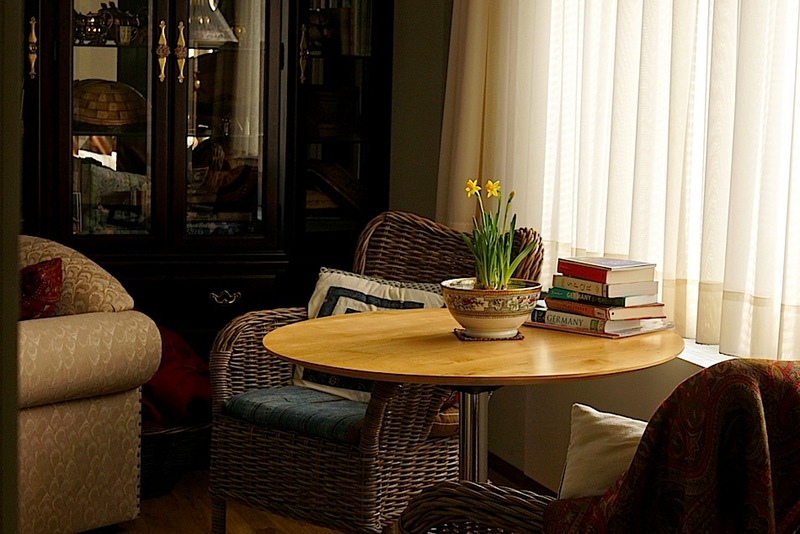 The bowl is charming, as are the daffodils.